It is no secret that Whole30 has been one of the most fascinating, challenging, and life changing things I have tackled so far this year. Though it was difficult at times, I really truly loved the experience and can't wait to keep challenging myself by sticking to the program principles. I am even going to take on a Whole60 next month and am really nervously excited for that journey! For those of you thinking of starting your own Whole30 or already have, here are some tips that I came up with from my own experience that should help you on your journey! I know that a large part of my success with Whole30 was due to keeping it simple. I would look at my meals as a sort of formula (protein, veggies, and healthy fats) and found things that I could quickly whip up to fit that. If you have the time to research or create new recipes, that is great and you should definitely go for it. I knew two things about myself, though, that did not lend itself to doing that every day: 1. I don't like spending very much time in the kitchen and 2. I am lazy. Those are the facts. So, know yourself and do what you need to do to make your Whole30 a success! + Don't think "I can't have." Think "I'm choosing not to have." A lot of the work involved in Whole30 is mental, and it can sometimes be draining. When you start to think of this challenge as something you are choosing to do though, it helps. When you are at a gathering with family and everyone is chowing down on cupcakes and pizza, and you are eating a salad or some veggie sticks, remember that those foods that look pretty appetizing aren't things you can't have; they are foods you are choosing not to have right now. It is pretty freeing to realize that you are not controlled by these things you "can't" have, but are rising above them and choosing to eat things that you know are better for you. + Always have a few Whole30 approved snacks with you. It is advised in the Whole30 program rules to try not to snack in between meals, as you should be eating enough food at each meal to hold you over to the next one. BUT, if you are out and suddenly get hungry, it is better to grab a Whole30 approved snack from your purse rather than pulling into the nearest drive thru. Great snacks on the go include cut up veggies, dried fruit (make sure there is no sugar added! ), nuts, and Lara Bars (sometimes...). + Use this time to try new things! To keep things interesting, it is a great idea to try new things! Have you never made anything with eggplant before? Pick one up and try creating something! Tired of just drinking water or unsweetened tea? Buy a bottle of kombucha and give it a chance! This is a perfect time to try new fruits, veggies, meats, drinks, etc. Plus, you never know, you may really love something you have never given a chance! + When things get tough, remember the reasons you are choosing to do this. Sometimes it can be easy to lose sight of the reasons why you started this journey, especially when you are particularly hangry and walking through the bakery section of the grocery store or are chopping yet another damn bell pepper to go with your dinner. In those moments, just try to remember why you decided to take on this challenge in the first place. Was it for your general health? To kickstart weight loss? To help with some pains you have? Whatever your reasons are, remember them and keep going! You aren't going to achieve your goals by giving up. + Follow other Whole30ers on social media! Have you done a Whole30? Are you planning to do one? On the fence about it? what a positive outlook on what sounds like a pretty difficult diet to stick to. Thanks girl! 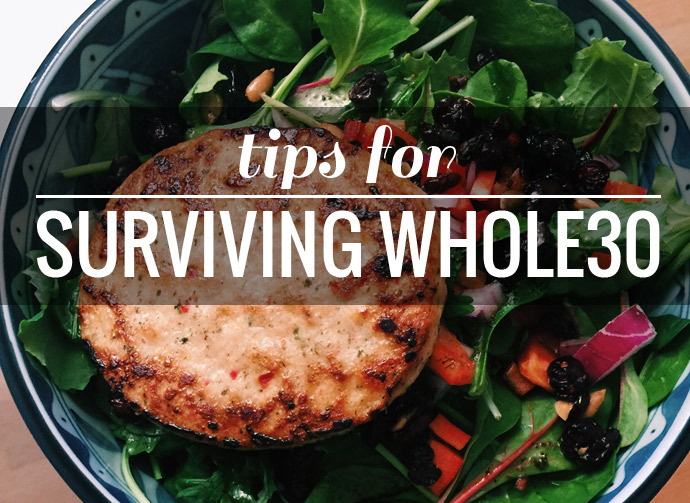 Whole 30 is pretty amazing, once you get through the first most difficult days!